A charming collection of heartfelt love letters from the early 1940s. Rowe’s debut memoir is an epistolary tale of love and history as told through her father-in-law’s devoted letters to one of his sweethearts, Wanda. 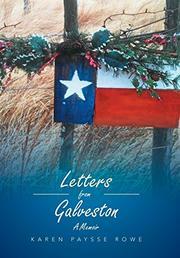 Starting in January 1942, Ed Rowe dashed a quick word to Wanda detailing the end of his first year in medical school, the reason he was in Galveston, Texas. As Ed made his way through the challenges of medical school, he shared his worries and triumphs with Wanda, who lived in Fairfield, Texas. The letters span a year and include anecdotes from Ed’s classes at medical school, book recommendations, and humorous tidbits about Ed’s roommates. His playfulness is apparent when he cites an account of one young man cutting the hair of another: “The radio was playing some swingy tune, and I don’t know whether the ‘barber’ knew it or not, but his hand in which he had the scissors was keeping time to the music and cutting hair all at once. You can imagine how wavy the other fellow’s hair is now.” His playful nature resurfaces when he says: “I had to stop writing a minute to throw some firecrackers at my roommate while he was in the shower. You should have seen him jump.” Amid Ed’s amusing and carefree writing is the serious undercurrent of oncoming war and registering for service in the Army. His personal story is peppered with references that sing of a different time, chronicling the simplicity of the ’40s. He writes with candor about his anxiety over his exams, his love for his friends, and his wistfulness for Wanda. Taking readers from his first year at medical school to his working in a children’s hospital, the letters eventually reveal his marriage. In a world where letter writing is almost obsolete, the charm of these handwritten notes, reprinted and transposed for the book, speaks of a different era and a lost art. Epistolary testimony to affection and the power of communication.